In 2014, three young men from far-flung parts of the world teamed up in Finland with an audacious plan that could soon help doctors save more lives (not to mention money) and chart a new course for healthcare. Oguzhan Gencoglu from Turkey is an AI and machine-learning whiz currently working on his Ph.D. in computer science, Hung Ta is a Vietnamese math prodigy with a doctorate in biotechnology, and Timo Heikkinen is a Finnish entrepreneur with a software industry background. 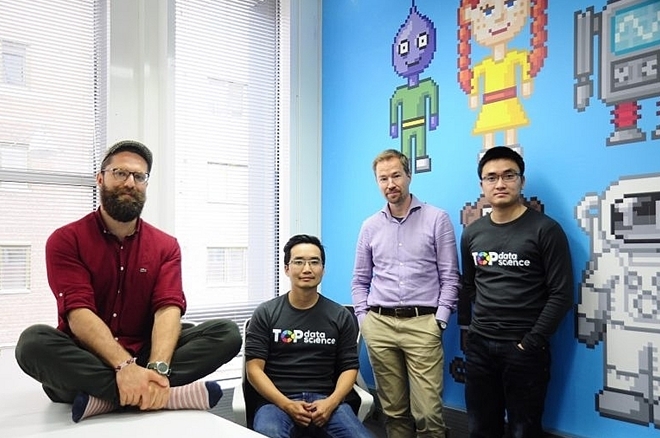 Together, they launched Top Data Science, an AI startup based in Helsinki that is developing software that can make sense of millions of data points, alert doctors to unseen medical patterns, help them diagnose disease, and track patients during treatment. Their “intelligent” code is already analysing thousands of MRI images and could one day help radiologists at the Helsinki University Central Hospital diagnose prostate cancer. Another set of algorithms is crunching data from the hospital’s intensive care unit and using it to identify high-risk cases that may soon need urgent medical care, as well as flag patients who are progressing well and could be released to standard hospital care. Heikkinen sought out Ta in 2013, after he applied for a job at the software company where Heikkinen worked as a marketing director. Ta, then a big-data consultant, listed on his resume achievements such as the prestigious Marie Curie research fellowship, a Ph.D. in data mining and bioinformatics—an interdisciplinary science involving software and biotech—and a silver medal in Vietnam’s national math Olympics. “His credentials were spectacular,” Heikkinen says. One area that seemed rich for mining was healthcare. A US hospital, for example, generates some 50 petabytes of data per year on average, enough to fill 20 million four-drawer filing cabinets with standard pages of text. However, 97 per cent of the information is never used. Their timing was good. In 2014, GE Healthcare launched in Helsinki the Health Innovation Village, a startup incubator located in Helsinki’s “Silicon Vallila” district. The village is complete with an artisanal coffee shop and tattooed baristas keeping the synapses firing for founders and employees of some 30 promising young companies from across Europe. They are developing such ideas as a smart needle to help doctors analyze meningitis, a line of clothing for premature babies, and tools to mitigate the side effects of cancer therapy. Heikkinen and Ta secured a desk at the GE village in 2014 and got to work. By then, they had recruited Gencoglu to help them develop Top Data Science’s first machine-learning algorithms. Through the Village, they also got access to GE’s business network and started showing their software to local medical institutions. A growing number of previous AI successes helped them make their case. Scientists at Stanford University, for example, trained their algorithm called CheXNet on more than 100,000 public chest X-ray images released by the National Institute of Health. In just over a month, the algorithm outperformed four Stanford radiologists in diagnosing pneumonia accurately, according to the university, and the code reportedly can diagnose up to 14 medical conditions. Doctors at Helsinki University Central Hospital were interested in something similar. They wanted to use Top Data Science’s software to help them diagnose prostate cancer using magnetic resonance images and minimise biopsies. Ta and Gencoglu started by feeding their algorithm with thousands of MRI images of the prostate and then used corresponding biopsy information and scores from pathologists to analyse the pictures and detect and classify lesions and other biomarkers in them. They used 80 per cent of their images to train the software and kept the remaining 20 per cent “hidden” from the machine-learning algorithm so they could confirm the results. The solution is still in development, he says. Next, the hospital decided to test the company’s software further by optimising its intensive care unit. The doctors asked Top Data Science to perform two predictive tasks: use data to identify patients who were at high risk of getting more sick and spot patients who would remain stable for 12 to 24 hours and could be released from the ICU. Here the Top Data Science team supplied its software with a diet of tens of millions of data points from the records of nearly 3,000 patients who had approved the use of their data. Erno Muuranto, managing director and engineering director at GE Healthcare Finland, says that the country is a good place to work on data applications for healthcare because local hospitals embraced digitisation early and now have big databases of patient information going back 10 to 15 years. Heikkinen says that in the future, Top Data Science’s algorithms could be used to spot other types of cancer and diseases. The company is currently working with GE Digital to move its software to Predix, GE’s app development platform for the Industrial Internet. The team has already travelled to GE’s software headquarters in San Ramon, California, and to its European Digital Foundry in Paris. Heikkinen says that as patient monitoring becomes remote with wearable devices keeping track of patients around the clock—something that Muuranto’s team is working on—the predictive power of his company’s software will come into full view. “We will be able to help doctors find patterns they would never get to see,” he says.